Literacy involves four interconnected activities: listening, speaking, reading, and writing. Interestingly, children do not learn these literacy skills one at a time – they do not first listen, then speak, then read, and finally write. All four domains develop simultaneously in young children. From the time your child is able to sit up at a table on his booster seat, he is curious about writing. Those first scribbles, when he steals your pen while you’re looking the other way or when he’s intently watching the lines he makes in his banana pudding, are developing his hand muscles and building a connection to the written images. Writing encourages reading, and vice versa. It’s a very short leap from accidental marks on a page to making intentional scribbles. Your child discovers the same boundless joy making her mark on a piece of paper as any Pulitzer Prize winning author feels completing the last chapter to a new book. You see it every time she passes the refrigerator and smiles at her work. That joy inspires your child to do it again and again. Collect your child’s work for a few months and you will notice clear preferences and patterns. Random marks are thoughtfully replicated. “Word’ scribbles are distinct from “art” pictures. At first, the patterns do not look like real words or real objects but they are not accidental either. 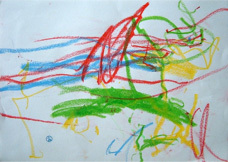 Does your child fill the entire page with large, bold strokes or is he making small precise loops? Listen for the day your child tells you he is writing. He is now aware of the difference between text and illustrations in his story books. Give your child the childhood gift to freely explore both the medium and message. Of course, he wants your pens and pencils. Give him fat markers, chalk, and crayons. While children are often drawn to smooth fast-writing markers over sluggish crayons, consider that crayons do more to improve the writing muscles because children must press harder to use them. Be sure to tell your young “pirate” that people used to write by dipping feathers into “ink” and give him some child-friendly paint in a cup to draw his own treasure map. Writing is for everyone, even children who don’t like to sit at tables. Driving small cars through paint captures the attention of speed racers. Busy fingers in shaving cream, finger-paint, and even sand on a tray, make all the same shapes and letters as children who enjoy sitting with worksheets. Children today, more than ever, need to build finger and hand strength. Young children need more practice with hole punches, eye droppers, ice cube tongues, tearing paper, and picking up small objects using their thumb and index finger. They also need a variety of choices of unlined paper – construction paper, computer paper, color paper, long thin paper. Paper without lines forces your child to figure out directionality, that is how to write in a straight horizontal line moving from left to right (in English). They also need writing surfaces that support the idea that writing serves a purpose – grocery lists, envelopes, prescription pads, order forms, bank deposit slips. Writing begins as imitation, then flourishes in pretend play. Children quickly learn why you write. There is meaning in written language. Writing helps you to remember things. It helps you to tell others what you think. And if you write down your words and your stories, those words never change. You can visit them over and over just like old friends. What began as accidental markings with little resemblance to letters and words soon becomes a source of meaning to your child. She “names” her words thereby claiming all the inalienable privileges of authorship. If she says she wrote “I love you”, she means it. The meaning of her symbols is irrefutable. Ah, the power of the written word! Now, it’s a minor step to recreating shapes, symbols, letters, and numbers that others can read and that others wrote. Your child first notices similarities and differences – consistencies. Letters make sounds. Words stand for people, objects, and actions. He reads the words he writes over and over. He reads familiar pages in his favorite book. He becomes a member in a very special club of readers where strangers speak his language. For more information on this topic, see Writing in Preschool: Learning to Orchestrate Meaning and Marks by Judith Schickedanz and Renee Casbergue (2004), available at www.naeyc.org.